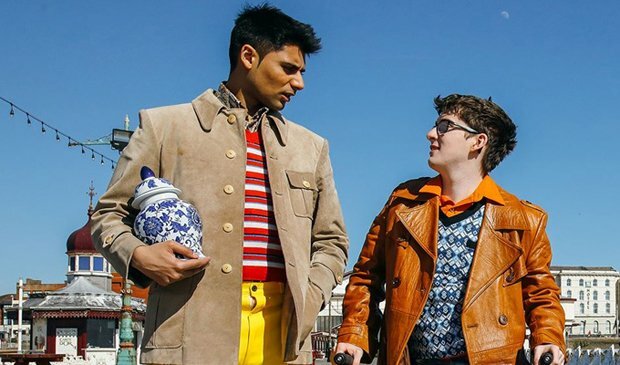 Films about mixed-race families are so rare it's refreshing to be presented with a British comedy about a young man who, as he attempts to track down his biological father, manages to connect with his Indian roots. In the 90s, Made in America approached the subject of race by injecting a dose of humour and, more recently, Vikram Gandhi's Barry took a more dramatic route with a story about Barack Obama struggling with his cultural identity while at college. It's a topic ripe for dissection and Eaten by Lions is a heartfelt step in the right direction. Antonio Aakeel stars as Omar and he's joined by Jack Carroll as his half-brother Pete. Raised by their beloved white granny (Stephanie Fayerman), the two are as thick as thieves but their bond is tested after she passes away and Omar decides to hit the road, getting on a bus to Blackpool to locate his dad. The pair make an entertaining double act, alternately bickering and defending each other, with Carroll's spirited and mischievous performance a hilarious highlight. Appearances from Johnny Vegas, Asim Chaudhry (of People Just Do Nothing fame) and Kevin Eldon – each bringing their own particular brand of comedy – spice the premise up somewhat, but the broader humour doesn't always land. A romance between a pink candy floss-haired Sarah Hoare and Omar is a little undercooked but Hoare delivers a gumption-packed performance as the delightfully gobby Amy. Director Jason Wingard makes the Blackpool coastline look appealing, with night-time strolls along a pleasure beach drenched in neon and farcical car-chases across the city lit by a dazzling backdrop of amusement arcades which lend it an almost magical ambience. The comedy may be absurd but there's enough emotion in the down-to-earth friendships and family relationships to make Eaten by Lions a mostly charming affair. General release from Fri 29 Mar.